With the help of children and Parents we have raised £150 for the BBC's Children In Need. 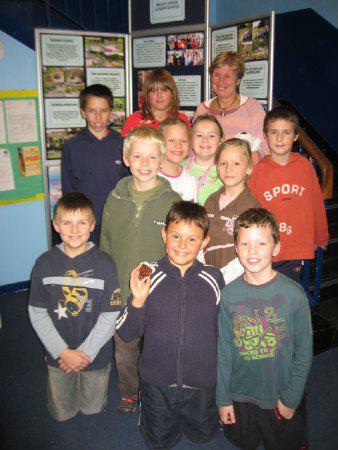 The children suggested and organized a cake sale which was held at lunch time on 17th November, Children In Need Day. They also sold special scratch cards for the event, guess the number of sweets in a jar competition and a guess the name of a Polar Bear cuddly toy, whose name turned out to be 'Snowball'. Well done everyone. The BBC Children in Need telethon has raised £18.3m, topping the amount raised on the night last year by £1m. Millions of viewers watched celebs take part in the seven-hour show which included live performances from McFLy, Keane, Girls Aloud and Dannii Minogue. Viewers were also treated to a duet by Peter Andre and Jordan, and Strictly Come Dancing's Emma Bunton performed the appeal's official single, Downtown. The final total for this year won't be known for a few months. Last years total reached £33m.